Football - Northowram v Hebden Royd Red Star. Chris Dunne for Northowram and Tom Garland for Red Star. Midgley United, Northowram, Illingworth St Mary’s and Ryburn United Reserves stepped up their bids for Halifax AFL honours on Saturday. They won the only four games to beat the weather following Thursday evening’s torrential rain and an icy Friday night. Midgley turned the screw on their title rivals by marching into an eight-point lead at the top of the Premier with a 6-0 win over Elland United. They were completing a wide-margin double over Elland, having beaten the next-to-bottom side 7-2 three weeks earlier. Two hours spent rolling the pitch at lunchtime, which broke up a crusty surface and flattened out any ruts, ensured the game went ahead. Midgley were dominant from the off with Greg Spink making the most of a chance in the starting line-up and Jason Cartlidge and Ian Hudson also in good form. The home side opened the scoring after 15 minutes when a Hudson corner was headed home at the back post by Calum Rodgers. Good work from Spink down the left paved the way for Rob Stansfield to double the lead and it remained 2-0 up to half time. Midgley’s leading scorer George Bamford struck a hat-trick in the space of 15 minutes to put much more daylight between the teams. 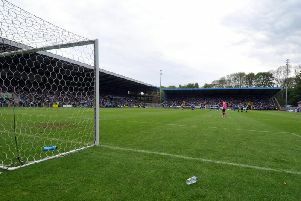 Spink set him up for a low drive, the ball going in off a post; Bamford found himself in space down the left and outfoxed the Elland ‘keeper to bag his second; and Joe Elwin set up the striker to complete his three-timer with a header. Spink rounded off the scoring at the near post with five minutes left after good link-up play between himself, Bamford, Hudson and Stansfield. Boss Craig Gee said. “Our lead has soon crept up. We were only a few points ahead three or four weeks ago. Last year’s Division One champions Northowram have taken to the Premier like a duck to water and they maintained their excellent start with a 4-1 home win over third-placed Hebden Royd Red Star. Neil Griffiths side produced possibly their best performance so far to make it five league wins on the bounce. Playing up the slope. they made the perfect start with a goal after two minutes. Mark Eade’s shrewd pass sent in Karl Amos and Alex O’Keefe reacted quickest to his cross and stabbed the ball home. Red Star almost drew level a minute later when a back header struck the bar and a timely tackle from Matthew Rushworth snuffed out another chance. Eade, in prime position, fired well over after the back-pedalling keeper clawed out O’Keefe’s deep cross. Both sides moved the ball well in an entertaining contest but it was the Rams who carried the greater goal threat and the keeper twice denied Amos. The Rams had by far the better of the second half and in the opening minutes Eade’s overhead kick was cleared off the line. After Ross Risdon’s superbly-timed tackle denied the visitors a one-on-one chance, the Rams doubled their lead on the hour. Chris Conroy neatly controlled a high ball and his perfectly-weighted scooped pass released Amos, whose sliding finish beat the advancing ‘keeper. The Rams, working impressively as a unit, grew stronger, and set pieces looked the likeliest route back into the game for Star, who had several big men in their ranks. However, the hosts conceded little and went close through Danny Rushworth, Eade and Dunne. On 75 minutes, Eade teed up O’Keefe and although his shot was heading wide of the far post, substitute Shaun Popek anticipated well and side footed home with his first touch. Five minutes later, Jake Baker was dispossessed as he tried to shepherd the ball out for a throw-in and when the cross came in the ball took a significant deflection off Danny King to give the visitors their goal. The Rams saved their best until last, courtesy of a brilliant individual goal from O’Keefe. After a one-two with Popek, his speed and close control took him through the defence and his finish capped a great display. All five games in Division One were off and only the St Columbas versus Illingworth St Mary’s encounter went ahead in Division Two. An early decision was made to switch the game to Saints’ 3G pitch at Trinity Academy and the move paid off for the home side who made it seven wins out of seven in the league this season. It wasn’t all plain sailing for Illingworth, however, with St Columbas proving difficult to shake off. Joe Griffin cashed in on a misplaced pass from the visitors to score after 10 seconds but St Columbas were quick to equalise with a shot from outside the box and then took the lead with a penalty conceded by Declan Rothery. Scott Hamilton’s back post header made it 2-2 and Joe Griffin bagged his second before half time. Griffin’s brother Jake extended the hosts’ advantage but St Columbas got their third and shrugged off the concession of an own goal to make it 5-4 midway through the second half. However, goals from Brandon Field and Michael Gregory took Illingworth clear again. Saints, newcomers to the league this season, are playing catch up with their fixtures and were making it seven wins out of seven. Ryburn United Reserves earned an Invitation Cup final date with Midgley Reserves when they beat Shelf United Reserves 4-0 at Greetland. The teams took time to adapt to tricky conditions and Nathan Hargreaves missed the best chance for Ryburn in the opening half hour after going through one-on-one with Shelf ‘keeper Matt Lloyd. The experienced Richard Redhead eventually gave Ryburn the lead with a shot from just inside the area after 30 minutes. James Lawton got a timely second for Ryburn just before half time and added another from long range as his side piled on the pressure in the second half. Ash Shaw came on in the final quarter and nicked a goal, Hargreaves shooting straight at Lloyd when he had a good opportunity to extend the lead. Ryburn are hoping to go one better than last season when they were surprisingly beaten by Shelf FC in the final.